The eMule project aims to provide data communication between remote villages by using ‘Data Mule’, i.e. people carrying Android devices. The devices will carry data between disconnected Village Access Points (VAP) and the Internet Access Point (IAP). This will provide email and services that use email (e.g. file transfer) to remote villages. This project released the alpha version on 2017 April. Users can send and receive emails from/to remote locations where Internet access is not available. 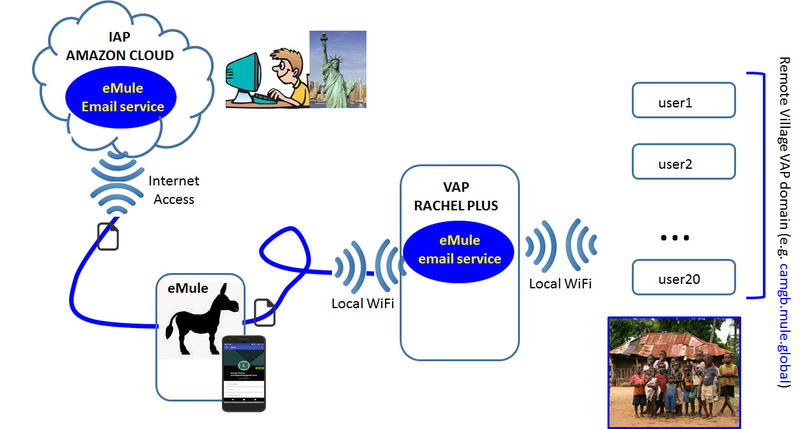 eMule: a person with Android phone carrying data between the Internet and remote locations as service. eMule services function stays in the cloud. Once eMule reaches the Internet, it transmits the carried data from the remote village to the cloud and receives email data from the could to deliver to the remote villages. eMule users have a membership and their work is logged including volume of data, distance they traveled and speed of delivery.